Our floor crews are bursting at the seams with personality, professionalism and pizzazz. 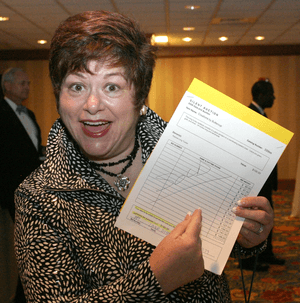 If you’re looking for people to stimulate bidding during your next silent or live auction we’ll be there for you, which will free up your volunteers to stop working and start buying! 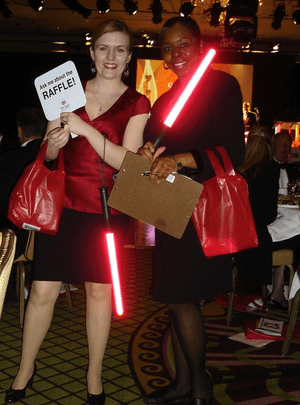 Non-profit and school auction clients love the Red Apple Auctions floor team. Our crew starts working as soon as your first guest arrives. Even argumentative bidders exhibit better behavior when an official from our crew oversees the process! The floor team identifies bidders with a light wand to ensure the bidder visible to competitive bidders and the auctioneer. They also ensure the bid number is visible to the recorder or clerk. What does it take to be a part of this dedicated team? Each individual was selected after an intense interview process. They’ve not only attended and worked other auctions, but they each participated in a training program. Perhaps more importantly, each individual is a “people person.” They love their work … and it shows! To ensure we represent your charity well, our team dresses appropriately. We look professional and wear badges for identification. You’re going to love our floor crews and you’ll quickly wonder how you ever got along without them! The important thing to remember with this is that you can expect a more successful event. 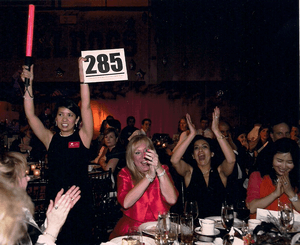 Click here to bring our floor crew to your next charity auction! 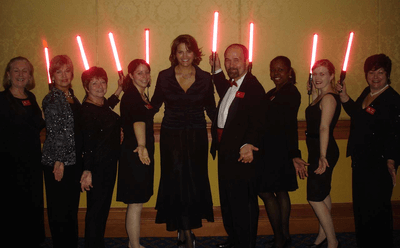 Here are some of the Washington, D.C.-based floor crew members with Sherry Truhlar.